Mandur bhasma (also spelled as Mandoor Bhasma) is an ayurvedic calcined iron formulation. Old iron rust is a raw material used for manufacturing of Mandur bhasma. Chemically, it is Ferric Oxide (red iron oxide). Mandur bhasma is a drug of choice for iron deficiency anemia (microcytic anemia) and debility associated with the anemia. In ayurveda, it is also used for amenorrhea (absent periods), dysmenorrhea, jaundice (hemolytic jaundice) and liver and spleen disorders. Mandur bhasma is prepared from following ingredients. The main ingredient is Old Iron Rust. A fine powder of Mandur (Old Iron Rust) is taken one part and Triphala Decoction is taken four parts. Iron rust is added in and Triphala Decoction and heated the mixture until all water content gets evaporated and only powder remains. After that, this powder is mixed and ground with Cow’s Urine and Aloe Vera juice. Then it is left for drying. When it becomes dry, then it is heated under high temperature. This process is repeated several times to get the Mandur Bhasma. Ferric Oxide or red iron oxide (Fe2O3) is the main chemical present in the Mandur (Mandoor) Bhasma. However, it processed with herbs and calcined under high temperature, which reduces its harmful effects in the body and enhances its bioavailability in the body. Mandur Bhasma has following healing properties. Mandur Bhasma is helpful in following health conditions. Mandur Bhasma is mainly iron supplement, but it also has valuable therapeutic benefits in other diseases as well. In ayurveda along with other remedies, it is widely used for jaundice, diarrhea, irritable bowel syndrome, indigestion, worm infestation and neuralgia. Here are some of important medicinal uses and benefits of Mandur Bhasma. 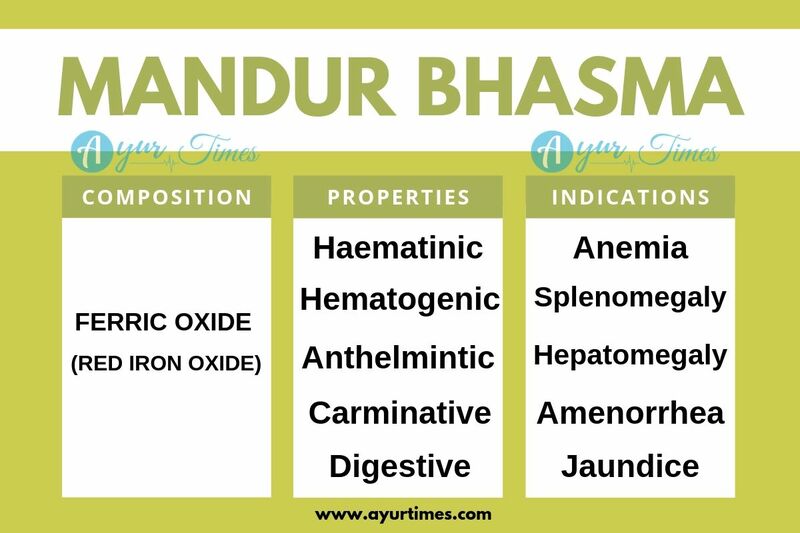 Mandur Bhasma is effective for iron deficiency anemia or microcytic anemia. It is processed with herbs and calcined under high temperature, which increases the bioavailability of the iron from the Mandur Bhasma in the body and reduces its unwanted effects. Therefore, it more LIKELY SAFE and TOLERABLE as compared to traditional allopathic iron supplements. Modern iron supplements lead to blackish discoloration teeth and blackish discoloration of the stool, but a well-prepared Mandur bhasma does not cause these side effects. Mandoor bhasma is also well tolerable as compared to Loha Bhasma used in ayurveda. Mandur bhasma also reduces general fatigue, physical weakness and yellow discoloration of the skin. It helps relieving almost all anemia symptoms including shortness of breath, dizziness, swelling and headaches. It also helps treat vertigo, laziness, anorexia and loss of appetite, which occur due to anemia. In people with severe anemia, heartbeat becomes rapid and irregular. Mandur bhasma along with Arjuna powder helps reducing this symptom and strengthens the heart. According to ayurvedic science, Mandur bhasma also has Hematogenic (aids in formation of red blood cells) action in addition to Haematinic (increases hemoglobin levels). Therefore, it is also beneficial for people with bone marrow disease. However, Mandur bhasma cannot alone work well in the management of Sickle Cell Anemia, but its formulation named as Punarnava Mandur is effective treatment solution for Sickle Cell Anemia. Punarnava Mandur helps produce more red blood cells and completes the requirement of iron. In addition to this, it reduces fatigue and swelling due to anemia. Edema may have several underlying causes. It may also occur due to severe anemia and liver disorders. If the underlying cause is severe anemia and liver disorders, then Mandur bhasma becomes beneficial. In combination with Punarnava powder or Punarnavarishta, Saribadyasava and Shilajit, Mandur bhasma reduces edema. This combination is more beneficial in pitting edema. Mandur bhasma reduces strange craving for eating earth, dirt, chalk or clay by increasing hemoglobin level. Actually, Geophagia occurs due to iron deficiency anemia in most people. Research studies also suggested that these people are also reported to have low calcium. Therefore, Mandur bhasma along with Praval Pishti is very beneficial. In these cases, clay also affects intestine’s health and may disrupt the absorption of important nutrients including zinc, iron and calcium. In such cases, a purgative medicine should be used before using Mandur bhasma. Further, Mandur bhasma also cleanses the intestine and detoxifies it to remove the foreign substances from it. Therefore, it also improves digestive functions and enhances absorption of other nutrients. Mandur bhasma has hepatoprotective characteristics. 2 to 4 weeks course with Mandur bhasma and Kumaryasava helps reducing bilirubin level in the blood and normalizes the liver functions. Mandur bhasma has lipolytic action and induces lipolysis. The possible mechanism lipolysis (breakdown of fats) is regulating the insulin level in the blood by reducing cellular insulin resistance. A high insulin level may be responsible for lipolysis inhibition, which leads to fat accumulation in the liver and other parts (especially visceral organs) of body. In case of hyperinsulinemia, liver stores fats and leads to Steatosis. Mandur bhasma has dual action. It acts on cellular insulin resistance and reduces insulin level in the blood by increasing adequate uptake of the insulin by the cells and conveying a signal of excess insulin level in the blood, which in turns regulates the insulin secretion. Secondly, Mandur bhasma burns accumulated fat by increasing fat metabolism in the body, so it treats fatty liver disease. Hemolytic Jaundice occurs when bilirubin production is increased due to degradation of the blood cells (RBCs). However, in such case, Mandur bhasma cannot work alone. There is also a requirement to prevent and stop severe degradation of red blood cells. For this, Praval Pishti, Mukta Pishti and Giloy Sat become essential part of the treatment. In addition to this, Mandur Bhasma plays a supportive role for reducing elevated bilirubin level and improving quality of red blood cells. Mandur bhasma may not have direct Emmenagogue action. Actually, iron deficiency anemia may also be a cause of amenorrhea in most of Indian women. In such case, Mandur bhasma is beneficial. For better results in amenorrhea (absent menstruation), Mandur bhasma should be taken in combination with Kumaryasava. Mandur bhasma also has antispasmodic action, which relieves abdominal cramps and pain. Iron deficiency anemia is also a cause of painful periods in many adolescent girls. Mandur bhasma essentially becomes beneficial in such cases by exerting dual action – antispasmodic as well as iron supplementation. The therapeutic dosage of Mandur Bhasma is as follows. Mandur Bhasma requires a proper dose adjustment. Some people may only require it in smaller dosage (less than 50 mg). The dosage should be adjusted according to the tolerability of the patient. Whatever the case, the maximum dosage of Mandur Bhasma should not exceed from 750 mg per day. Mandur Bhasma is LIKELY SAFE & WELL TOLERATED in dosage of 125 mg twice daily. The higher dosage may also be POSSIBLY SAFE under medical supervision. There are no side effects observed with the use of Mandur Bhasma even for the long-term treatment duration of six months in dosage less than 125 mg twice daily. In dosage of 250 mg twice daily, Mandur bhasma may also be safe for a short-term use, but this dosage should be used with caution on regular basis for period more than 4 weeks. However, other effects are not available, but it may cause liver damage and alter pancreas functions. According to ayurveda, Mandur Bhasma is a light medicines and highly tolerable for pregnant women. It can be used safely in dosage less than 50 mg per day in pregnancy. Can Mandoor bhasma cause red coloured urine? How does it excreted by body? Mandur bhasma does not cause red coloured urine. It is excreted from the body through biliary excretion. Is it necessary to add cow’s urine in formation of mandur bhasma? What about the availability of mandur bhasma without animal organ please do reply? We cannot alter the techniques described in the ancient texts.